I want to transfer all my photos from my Canon camera to my iPad mini in wi-fi. How can I do that ? I have installed the app CameraWindow on my iPad. 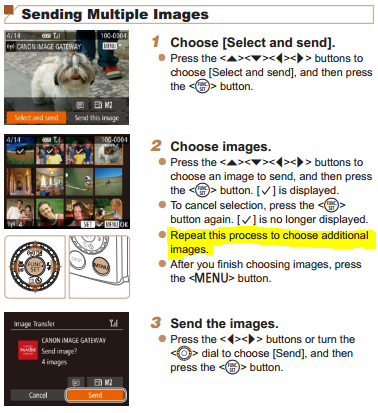 I found a way to choose and transfer one photo. How can I transfer all photos ? My camera is a Canon PowerShot SX280 HS Wi-Fi. As far as I can remember, once you open CameraWindow on your iPad, and you have a connection to your camera, you can see the thumbnails which you can individually select by tapping them and then tap the save button. Both of the answers to your questions are outlined in the manual as Andy Blankertz noted. Manuals typically aren't very good at telling you what you can't do, but they are usually good at telling you what functionality was built. In this case, you have to deduce the fact that you can't do exactly what you want with an all in one button, but instead you have to repeat a few steps. 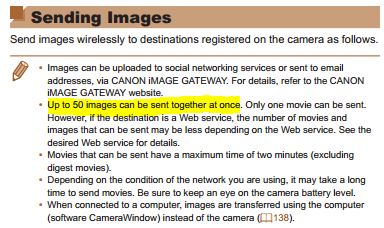 The only option to download "all images" would be to select each image individually using the instructions on page 142, and repeat as necessary for each batch of 50 images as noted on page 141. This may sound tedious, but just to give you an idea of how the Canon software is evolving, the EOS Remote app that I have to work with on my DSLR only allows you to download a single image at a time and does not even allow you to select multiple images at all(let alone 50). Not the answer you're looking for? Browse other questions tagged canon file-transfer powershot ipad wifi or ask your own question. How to transfer images from Nikon D3300 to external devices?